This page will serve as starting point for all the new people who are joining the app for this season, or even the veterans returning who want to brush up on their skills. Its clear that things are going to change dramatically this year, so this is your one stop shop to get an edge on the new season. 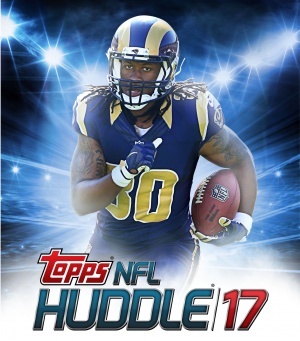 As a whole, Huddle focuses around two main elements, just like the other Topps apps. There is a collecting element, where users chase down rare inserts or sets, in pursuit of a top hoard in the app. Similarly, there will be users who play along live with the NFL games, scoring points according to the cards they have in play. There are three main types of cards in Huddle, and all of them are valuable in their own right to different people. Base – These cards are the normal pack filler player cards that are available in every pack. They will be unlimited in count and give rewards when you collect sets. These will be valuable at first, but will settle down heavily as people open more packs. Inserts – These cards can be the 30 week marathon sets that come in different rarities, usually starting around launch. They can also be one off releases that can be extremely rare or extremely common, these were some quite cool releases last year. Lastly, they can also be chase sets, which are released daily or in multiple waves until the set is completed. Boosts – These are base cards whose sole purpose is to score above gold level. They can range from 2.2x to 40x by the Super Bowl, but it all depends on how Huddle chooses to roll with boosts this year. Huddle will be cornucopia this year, and new inserts will be released daily, multiple times per day. Before I dive deep into the collecting strategy, let me state up front that you will not be able to get most of the good cards without spending real money. You will also not be able to get every single card released without spending LOTS of real money. As a business, Topps needs the users to spend in order to support the function of the app, and thus, insert releases are designed to favor people who spend. There is a daily bonus that will be your lifeblood in the app if you are not interested in spending real money, but it will hardly be enough to get to the top of the collecting mountain. If you are a free user, I would highly suggest choosing ways to spend your coins with extreme caution. Dont chase inserts just to chase inserts. I would collect a player or a team, and be ready to trade like a mad man. The top cards in the game will all be high boosted cards or cards that are released with an insanely low card count. Limited series will undoubtedly be insanely rare, and that means that they will also be valuable. The main signature series and the variants will be accompanied by other types of sig cards, but as a whole, anything with a facsimile autograph will increase value dramatically. Each week, there will likely be one to two sets that will be released incrementally each day. The value of the cards will be determined by player, team, and card count, as well as release availability. If they release a low count Tom Brady card in special packs, its going to perform differently than a high count Tom Brady card in a normal pack. Similarly, the cool factor will influence collector reaction to the way the card is perceived. If the insert looks awesome, many more people will want it. If the insert is simple looking, or really not that cool, it wont be as in demand. You will get a feel for the cool cards vs the lesser cards pretty quickly – not every set will be a winner. Along side all the weekly sets mentioned prior, there will be a number of “Marathon” sets, which will be released on a weekly basis for a prolonged period of time. These marathon sets usually have more residual value in the app, because of a promised award that will be distributed according to the set design. For example, there will be a number of sigs released during the weeks of the season, and for each 10, they will offer a special reward card for people who have collected every sig. The marathon rewards are highly coveted, and usually low count, so it is worth it to participate for the whole year. When it comes to actually playing along with the live games, Huddle get really fun. There will be contests for each day of action, and these contests have prizes associated with them. If you are someone like me, who spends your Sundays in front of your TV, this game will be right up your alley. To play along, you will need to join contests in the head to head screen. These contests will be built around games, time of day, player types, anything and everything you can think of. Prizes will range from coins to cards and packs, so take a look before selecting one to join. Not every contest will play to the strengths of the cards you have available, so be methodical in the way you work through your choices. To play in the contests, you will be able to select from the applicable cards in your main deck. Each base card has a boost level, which goes from 1x points to 2x points. There is a scoring formula for each type of play on both offense and defense that will provide a score for your team. WARNING: No card will score unless it is in your starting lineup at the time the points are scored. Points flow into the app through API, so dont expect them to update immediately after the play is done. Keep refreshing your point total to see that your score has increased before switching out cards. NOTE: The total on the back of a card only reflects the player total for that game, NOT the amount they have scored while active in your lineup. Some positions will definitely be better in their scoring than others. Think of this in normal terms for fantasy, as QBs, WR, RB and TE, will be the best cards to stack for your lineup. You can play more than one card of each player, so a lot of people will stack duplicates to play to get maximum points. For example, if Ben Roethlisberger throws a long touchdown to Antonio Brown, you will want to have as many of those cards in your lineup as possible. As a rule, the receiver will tend to score more points than the QB on every reception, as the scoring is weighted more towards receiving yardage than passing yardage. This is very similar to regular fantasy. The receiver gets more points for yardage and TDs, which means that Gold QBs will score less on the play than even green or red WRs. To really maximize your points when there are a ton of games going on, the Red Zone channel is your best friend. They not only show all games that are on the verge of scoring, but also recap big plays seconds after they happen. This usually gives enough time to make lineup changes before the API loads the scores. There are other inserts that will have boosts above the Gold level as well, some of which can go pretty high. Each of the nationally televised games on Thursday and Monday will have Game Only Boost cards, which are available in special packs. These cards are only boosted for one game and will retract to a normal boost level the next week. To win the main contests for these games, you will need to get a bunch of these, which may not be easy. Its worth your time to chase down a handful of them if you can, as they will provide some great points for your chase during those contests. There are some cards that score above the rate available in the gold 2x players. These boosts are extremely limited and are usually tough to get your hands on. Even though they score only a fraction of a percent more (2.2x or 2.4x vs 2x), they should NOT be traded for multiple golds. It is in your best interest to trade boost for boost, and if you find someone willing to give up golds for boosts of any color, your golds are always worth giving up. Gold card circulation will NEVER be limited more than the odds to pull them in packs, which means that the value of a boost, whose card counts are very limited will always be in a favorable state. You will not be able to be a top player without trading. Its one of the most important elements of the game, no doubt about it. AT LAUNCH, 2016 cards will be hugely in demand. You will need to overpay for top players, even in low boost. As the season moves on, this will change dramatically as the market saturates. Similarly, it might take a while for the value in the market to shake out across the board after launch. The first marathons will be among the most valuable, but could drop significantly in value as the season progresses. New hot cards will always be more valuable than older cards, and in the past Huddle has always brought advanced mechanics in card releases as the season moves on. For gamers, I would suggest offering more on the cards with dupes above eleven. It means that they have more of that player than they can play at one time. They may be saving trade bait for new cards, so dont lowball them and expect them to be happy. Sigs and inserts with super low card counts are the highest value cards in the game, dont offer commons and non-inserts for any of these cards. It will only cause friction and low trader scores. I had to go 9-1 to get my first sig back a few years ago. Not kidding. I would suggest against lowballing any player when it comes to high value cards. When it comes to lower value base cards and high count inserts, lowball away as the season moves on. You never know, but be prepared to be ignored if you offer junk for nice stuff. New inserts in any set are usually worth more than older inserts, with very few exceptions. If a new insert is released, it automatically becomes more valuable than older inserts of that same rarity. Dont expect to trade 1-1 for a new card with an old card. Some collectors are rabid, so they will overpay, however some collectors will hold out for a good offer. 2014 and earlier cards DO NOT SCORE POINTS. Similarly, they will not be as valuable as 2014 cards. You can see the 2013 cards by the white border surrounding the whole card, or by flipping it over to see if it has scored points to date. 2013 base cards are all the player headshots with no game action shots. Some 2013 cards have action shots, but will still have a white border around the outside. 2014 had a combination of action shots and head shots, and will likely have colored borders corresponding to the boost. They look DRASTICALLY different from 2015, so be aware. Some 2014 and 2013 cards still retain significant value, especially the rare sigs from each year. I would still consider the trade you are getting if you receive a low card count sig, but all 2015 sigs will automatically overvalue any of the 2014/2013 sigs by a SIGNIFICANT margin. Similarly, 2015 inserts will be more valuable than any low insert from 2014 or 2013. Be careful in the way you trade for older cards, but dont give up on the old favorites. Top 2013 sigs are: Adrian Peterson, RGIII, Tony Gonzales, Eli Manning. If you want an answer on anything Huddle related, tweet at the main account. The other entities are just there for reference.